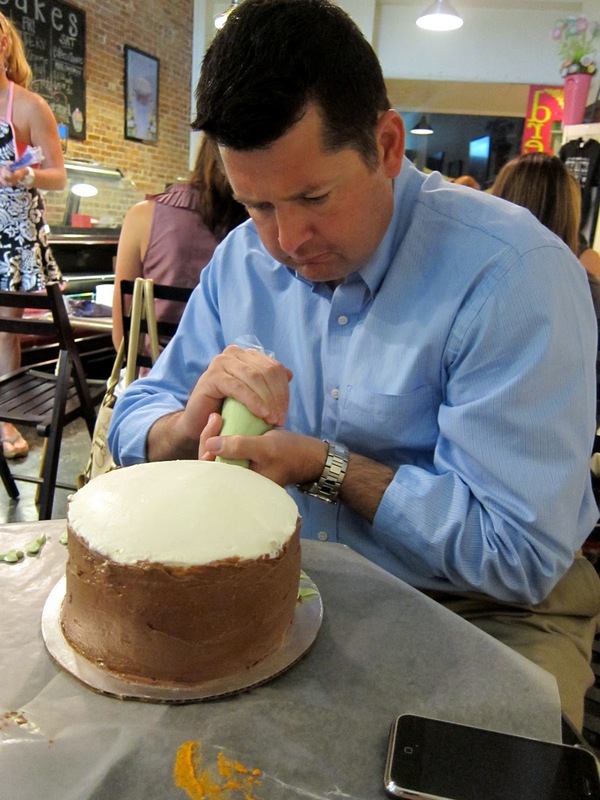 I had the opportunity to go to Cakes & Cocktails at Dreamcakes Bakery in Homewood on Thursday night. I missed the first set of classes back in the spring, so I was excited to get into a class this week. I had planned on going with a friend, but she bailed on me at the last minute. Luckily, Chicken Legs said he would go with me. He's a great guy! Jan is demonstrating how to make the frosting on a cake smooth. She did it in no time and it was perfect. She gave us some good tips like using a spray bottle to help smooth the icing out. She also said you could add almond or clear vanilla extract to the water - love it! Luckily for us, the cakes were already iced. After Jan's demonstration on how to make a beautiful "princess cake", we had to decide what we wanted our cake to look like. That was tough! There were lots of fall/halloween colors and candies ready for us to choose from. 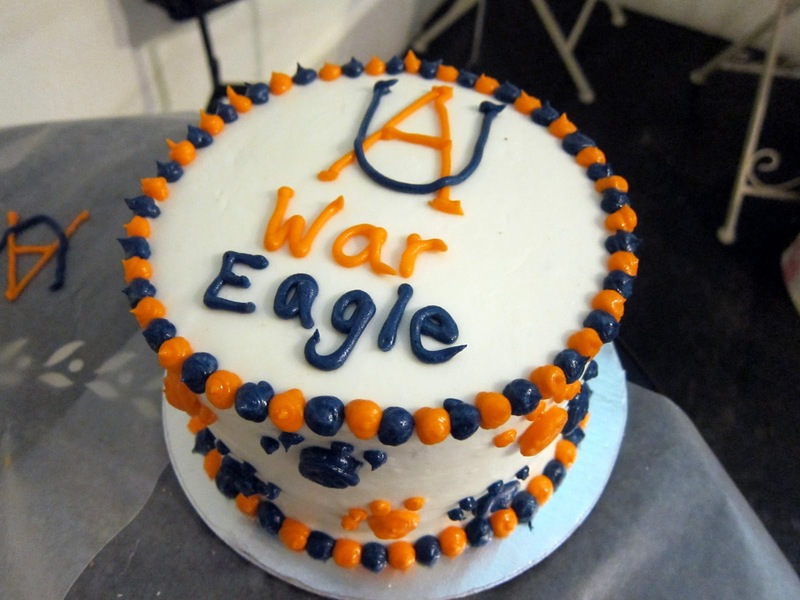 Jan also suggested Auburn or Alabama football cakes. 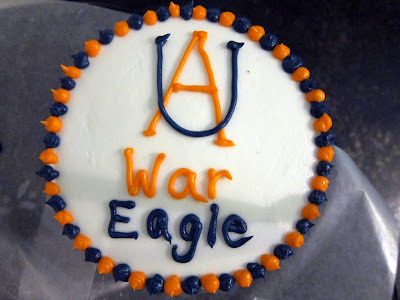 After much deliberation, Chicken Legs chose to make a pumpkin cake and I made an Auburn cake. 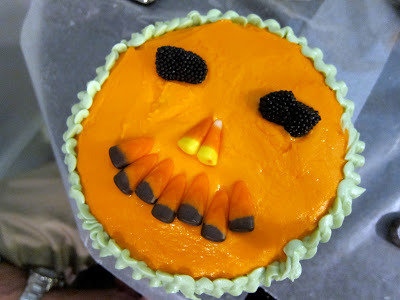 Chicken Legs worked really hard on his pumpkin cake. He added some brown icing to the sides and piped some green leaves around the bottom. He did a really great job! I was very impressed. He must have been paying attention when I was making cookies and cakes. For my Auburn cake, I decided to put tiger paws all around my cake and then top it off with an "AU" and "War Eagle". 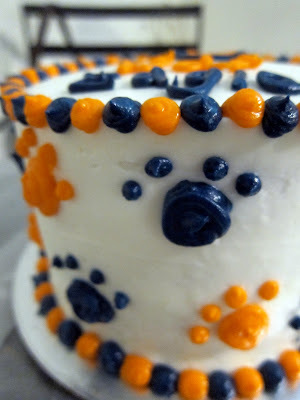 I did both orange and blue paws. Jan was nice enough to mix me up some navy icing. Here is Chicken Legs finished cake. I thought it was really cute! I love the candy corn mouth and nose. He also did a great piping job on the edge. Here is my finsihed product. I thought it turned out GREAT! I impressed myself with my writing. It was much easier than I thought it would be. 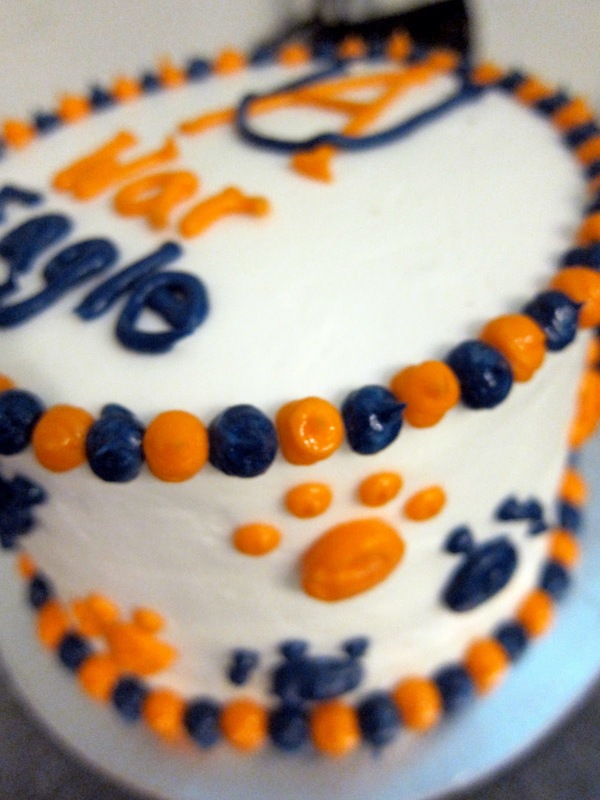 My skills have improved greatly since I took the Wilton cake decorating class many years ago. We had a great time. I loved that all I had to was decorate the cake. It was nice that someone else baked the cake, iced it and prepped all the piping bags. I just got to go and have fun! Chicken Legs favorite part was eating the cake when we got home - it was excellent! Jan Moon is so talented and SO nice. It was so nice of her to take an evening and teach everyone how to make a pretty cake. Dreamcakes is having more Cake & Cocktails classes this fall. Be sure to check their website, facebook or twitter for the dates! Todays game should be a good one - I'll watch it until the West Virginia game comes on. I never knew about using a spray bottle. And adding extract to the spray bottle? Genius! Your cakes look great. And I think your husband is a keeper. I'm not sure mine would have gone to a cake decorating class with me! Oops. Dan is my husband. I forgot he used my computer last night. He'd think your cakes look great too though! thanks for sharing your fun with us! Love the Auburn cake! War Eagle!